Traveling in the midst of A(H1N1): Is it safe? I’ve been back in Manila for exactly 8 days now, past the 7-day period to screen for flu-like symptoms. In those 8 days, I did not get a sore throat (even if my sister from Melbourne had a very sore throat and was coughing and spreading germs all over the place), nor did my temperature went past 38 degrees. After traveling through countries affected by the A(H1N1) flu virus in Southeast Asia for 38 days, I’m clean. I was so paranoid when I was still preparing for the trip. I made sure I had a bottle of alcohol-based hand sanitizer, and even bought a small bottle of 70% isopropyl alcohol to ward off the germs. I filled one section of my toiletry kit with Vitamin C tablets, Centrum mutivitamins, and over the counter medicine for colds and fever. I wasn’t taking any chances. When I got to the airport on May 30, there were a number of people wearing masks, but majority aren’t. As with most trips, I stop worrying as soon as the trip starts. Still, I wasn’t taking chances. I wash my hands whenever I get the chance or sanitize it with alcohol after going to a crowded area. 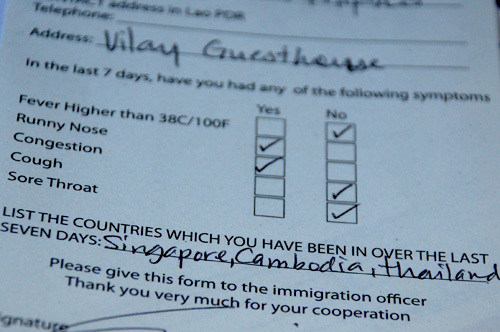 I was so scared when I had that terrible cold after crossing the border from Cambodia to Thailand. I was still feeling okay in Siem Reap, but by Friday night, I had this really terrible clogged nose in Bangkok. I bought some medicine for it, and decided to just stay and rest in my hostel room instead of exploring Bangkok. I knew I had a flight in two day’s time, and showing up at the airport in my current state would have been troublesome. That one day of rest did wonders, for the following day, I was out wandering the streets of Chinatown (and ended up finding a store that sells doll clothes and accessories!). I really was feeling much better, and come Monday, the clogged nose was reduced to sniffles, though I did get additional questions from the health inspectors since I had a cold. That was pretty much the worst damage to my health during my entire trip. Getting enough sleep helped a lot, as well as my irregular ingestion of multivitamins. I did get a flu shot before I left, and I like to think it helped me avoid getting worse after that cold. So back to the question: Is it safe to travel with the A(H1N1) pandemic? Yes, it is. Keep your immune system in tip-top shape and you don’t have anything to worry about. Yes. Since ah1n1 has now been degraded to just a seasonal flu. Just make sure you have a disinfectant with you like soap or alcohol. I hope people continue to support Philippine Tourism despite the happenings and the crisis. The dampener to my international travel plans was the 10-day quarantine which we had to file in the office as Sick Leave. But now that it has been lifted, workers like us should be okay. Tuloy ang lakwatsa! Yeah – I keep telling people to stop being so paranoid (although can’t blame them much really in this current condition)… If you are relatively fit and healthy, and have your shots before you leave your country, you should be okay. And its really always very important to take precautionary measures when you travel. I always bring a bottle of hand sanitizer with me whenever Im on the road. You can never be too careful!